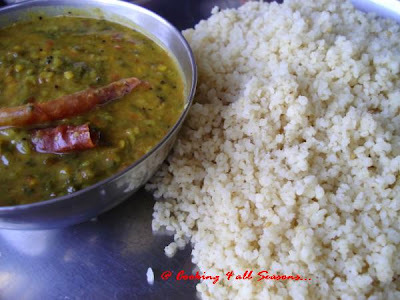 Cooking 4 all Seasons: Korra Annam with Dal with Fenugreek leaves (Menthakku Pappu kura) ~ Andhra Special! After using Korra Biyamu in the pumpkin paratha, Athamma was asking me if anybody uses Korra Annam. This is commonly found in rural Andhra, India and opted for, in place of regular rice. I was searching the net and couldn't find much, so Athamma was all excited in making this for me to post. She gets her regular supply of this from whoever visits us from their native place. 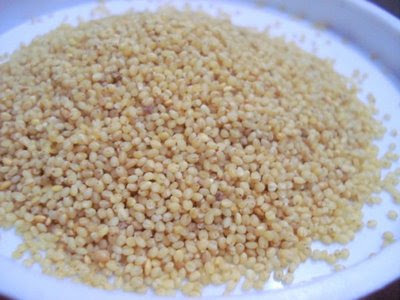 The grains are very small and on touching, feels like kind mustard and tastes brittle. So she got the plate ready and wanted to make the annam (cooked rice). 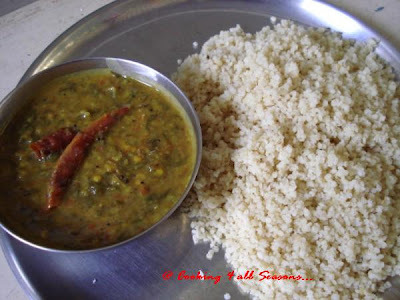 Normally this is relished with Dals with Green leaves. I believe it tastes great with Gogura pappu, another Andhra special! But we can have it with all the varieties of Thotakura pappu. We choose Methi or Fenugreek Leaves for the Dal. It was an yummy combination. We consume fenugreek quite a lot in our cooking. Its always a part of the seasoning items for dals and sambar. And its used for helping fermentation of Idli batter. But I believe its healthy eating soaked Fenugreek seeds. Dad advises us to eat 1 tsp of Fenugreek that's soak overnight in water. Actually I never felt its bitter, though I have heard everybody say so. Both leaves and seeds are very much used in our cooking. We love Menthakku Pappu and make sure we make it atleast once a week. We get two types of Methi leaves. One variety is very small leaves and are sold as small bunches of them, while the other variety is long stacks with little longer leaves. Both taste great, only are available at different seasons. So when the entire plant is packed with so much good factors, we don't need any excuse to cook this frequently! I would like to thank Suganya for the lovely input on this. For other information on net about Korralu, check Indira's , Suganya and Mythili's. I would like to thank Mathy for the informative comments. It feels good to knwo all this information.